In late March, a coalition of jihadist groups named Jaysh al Fateh overran Bashar al Assad’s forces in the provincial capital of Idlib. Their victory was one of the insurgents’ most significant accomplishments to date. In the aftermath of the battle, fallen “martyrs” were lionized by the various organizations that participated. In the process, al Qaeda veterans in Jaysh al Fateh’s ranks were publicly revealed. One of them was known as Abu Hafs al Masri, a senior leader in the al Qaeda-linked Ahrar al Sham movement. 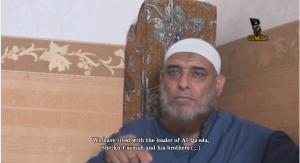 A video posted online by jihadists earlier this month records a brief talk Abu Hafs al Masri gave prior to this death. The video was translated into English by a small online jihadist outfit calling itself GIIMedia. Abu Hafs explained in the interview that he served al Qaeda for 17 years and had lived with the organization’s most senior leaders. Shortly after the battle of Idlib, online jihadists identified Abu Hafs al Masri as both an Ahrar al Sham leader and as an al Qaeda veteran who fought in Afghanistan, Bosnia and Somalia. According to some accounts on Twitter, al Masri served as an al Qaeda trainer at one point. In a separate compilation of tweets and statements posted online, Sheikh Abdallah Muhammad al Muhaysini, who is affiliated with al Qaeda, said he had met with Abu Hafs and praised him as one of the “martyrs” in Idlib. Prior to his death in late March, Abu Hafs al Masri’s role inside Ahrar al Sham was not widely publicized. This is consistent with al Qaeda’s original intentions for the jihad in Syria. Other al Qaeda veterans were seeded in Ahrar al Sham’s ranks, holding positions of considerable influence. One of them, known as Abu Khalid al Suri, doubled as Ayman al Zawahiri’s chief representative in the Levant. It was not until after Abu Khalid al Suri was killed in February 2014 that numerous photos of him waging jihad in Syria were posted online. Many of the photos showed al Suri side-by-side with Hassan Abboud, Ahrar al Sham’s top leader. It is obvious from the photos and other information that surfaced that Abboud, who was subsequently killed in September 2014, considered al Suri to be his mentor and teacher. The Long War Journal first reported in December 2013 that Abu Khalid al Suri was a senior member of Ahrar al Sham. At the time, his role was not publicly disclosed by the group. Another senior al Qaeda figure, Adel Radi Saker al Wahabi al Harbi, was the military commander of Jund al Aqsa, which also took part in the attack on Idlib. But al Harbi’s leadership position in Jund al Aqsa was not revealed until he, too, was killed while fighting. The US government had offered a $5 million reward for information leading to al Harbi’s whereabouts. In 2012, the US Treasury Department identified him as the deputy head of al Qaeda’s network in Iran, a position he held until relocating to Syria. Good, feed him to the hogs! ! Another dead jihadist – so sad!